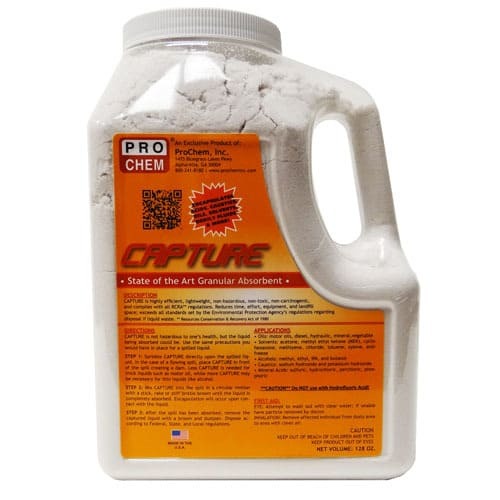 CAPTURE NEW & IMPROVED | Pro Chem, Inc. CAPTURE NEW & IMPROVED is a highly efficient, lightweight, naturally occurring, amazingly absorbent material. It reduces time, effort, equipment and landfill space and exceeds all standards set by the Environmental Protection Agency’s regulations regarding disposal of liquid waste. This dust-free formula eliminates airborne particles, making it a safe noncarcinogenic product. Safe to use on all surfaces. It leaves no residue so mopping is not required after cleanup. Oils: Motor oils, diesel, hydraulic, mineral, vegetable, etc. CAPTURE is not hazardous to one’s health, but the liquid being absorbed could be. Use the same precautions you would have in place for a spilled liquid. Step 1: Sprinkle CAPTURE directly upon the spilled liquid. In the case of a flowing spill, place it in front of the spill creating a dam. Less is needed for thick liquids such as motor oil, while more product may be necessary for thin liquids like alcohol. Step 2: Mix CAPTURE into the spill in a circular motion with a stick, rake or stiff-bristle broom until the liquid is completely absorbed. Encapsulation will occur upon contact with the liquid. Step 3: After the spill has been absorbed, remove the captured liquid with a broom and dustpan. Dispose according to federal, state and local regulations. 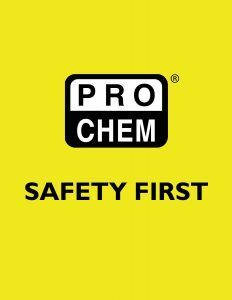 CAUTION** Do NOT use with hydrofluoric acid.